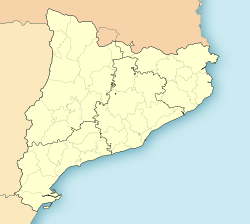 Cornellà de Llobregat (Catalan pronunciation: [kurnəˈʎa ðə ʎuβɾəˈɣat]) is a municipality in the comarca o the Baix Llobregat in Catalonie, Spain. It is situatit on the left bank o the Llobregat River. The history o Cornellà de Llobregat is defined by three principal factors: its proximity tae the ceety o Barcelona, its bein a aurie o passage (as wis the entire Comarca o Baix Llobregat) tae an frae the caipital o Catalonie, an the presence o the Llobregat River. Its name is o Roman oreegin (Cornelianus) an the ceety's airchitectural characteristics possess Visigoth traits. The first written reference tae the ceety dates frae 980 AD, at which time a kirk an a defence touer tae waird aff the Saracens awready existit in the same place as the current castle (constructit in the fowerteent hunderyear). The ceety wis incorporatit intae Barcelona's territory in the thirteent hunderyear an, for a short time, belangit tae the "Franqueses del Llobregat" in which agricultural activity wis principally developit. Citilab is a laboratory for ceetizen innovation based in Cornellà. It is locatit in the umwhile Can Suris factory biggin. Wikimedia Commons haes media relatit tae Category:Cornellà de Llobregat.